Licensed From – Amherst Records, Inc. Published By – Harlem Music Inc.
Reissue that was likely pressed during the early 2000s. Same cover, but different vinyl. Although the runout groove etchings are similar, the vinyl is different. 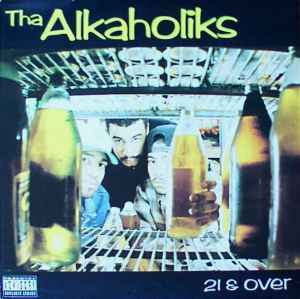 Check the scans and compare the inner pressing-rings of the label: On the repress the inner ring strikes the "Th" and the "ks" of "Tha Alkaholiks", on the first pressing "Tha Alkaholiks" does not touch the ring at all. Also the paper of the labels is more dull and faint than the original paper.